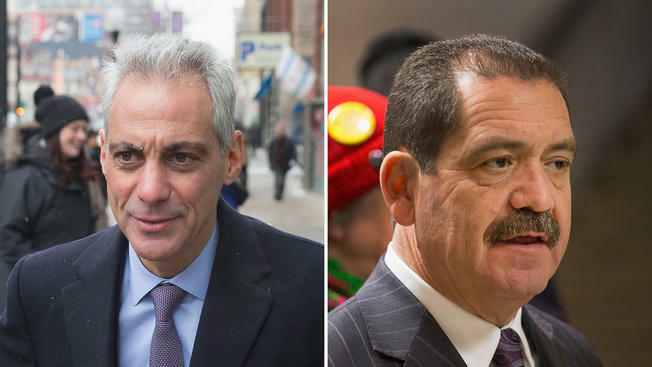 The race for mayor is down to the wire as Rahm Emanuel and Jesus "Chuy" Garcia push for the early vote ahead of the April 7 election. The most recent poll by Ogden and Fry shows a high number of voters remain undecided (about 18 percent), but patterns have begun to emerge in the last few weeks. As Emanuel tackles his image problem and attacks Garcia's vague financial plans in TV advertisements, his popularity in the polls rises. Meanwhile, Garcia continues to rack up the big endorsements and travel the country for some last-minute funding. Most recent polls put Emanuel significantly ahead of Garcia but not quite at 50 percent, meaning both candidates continue to fight hard for the undecided vote and pinpoint those voters they still have time to convince. For most of the runoff race thus far, both candidates have chased the African-American vote. While Garcia took the lead early on with endorsements from the Rev. Jesse Jackson and former mayoral candidate Willie Wilson, among others, Emanuel managed to stay in the race, albeit far behind Garcia. On Friday, the mayor earned an endorsement from the Rev. James Meeks, who had a change of heart after outspokenly opposing Emanuel in 2011. Meeks also announced the support of nine other influential African-American ministers included in the endorsement. The importance of the African-American vote, however, has faded slightly to make room for the Latino vote in both campaigns. Garcia has had support from the Latino population in the palm of his hand for the entire election season, but he'll need to get those voters to the voting booth if he wants to stay in the race. A new poll conducted by Latino Decisions shows Garcia easily holds the majority of the Latino vote, but the results also showed that neither candidate has done very much to encourage them to actually vote. But instead of going door-to-door in the heavily Latino neighborhoods in the city in these last days before the election, Garcia has been traveling across the country to raise money. On Monday, Garcia was in New York. On Tuesday, it was D.C. Last week, he was in Los Angeles. Early voting is now underway, marking the most important period of election season for both candidates. Election Day itself, April 7, falls directly in the middle of Spring Break for Chicago Public Schools and many Chicago Catholic schools, so voter turnout is expected to be low that day. And with record early voting turnout Monday, now is the time for the final push.